As the sun sets on another Saturday, my list of things to do is no shorter, but I can say I spent the day with my old friend. My old friend baseball that is. First I got the photos from last night's trip to the Phillies game uploaded. 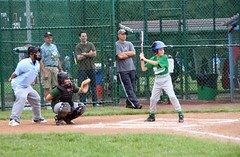 Then I spent much of the day with John at his MLAA Fall ball game and the impromptu practice afterward. Photos of the festivities are here. Now I am sitting back watching the Phils on Fox and hoping they look better than this next week.